Lars & Emma, property owners in Alhaurin El Grande. How we found our dream home in Spain, obtained residency and paid less than planned! 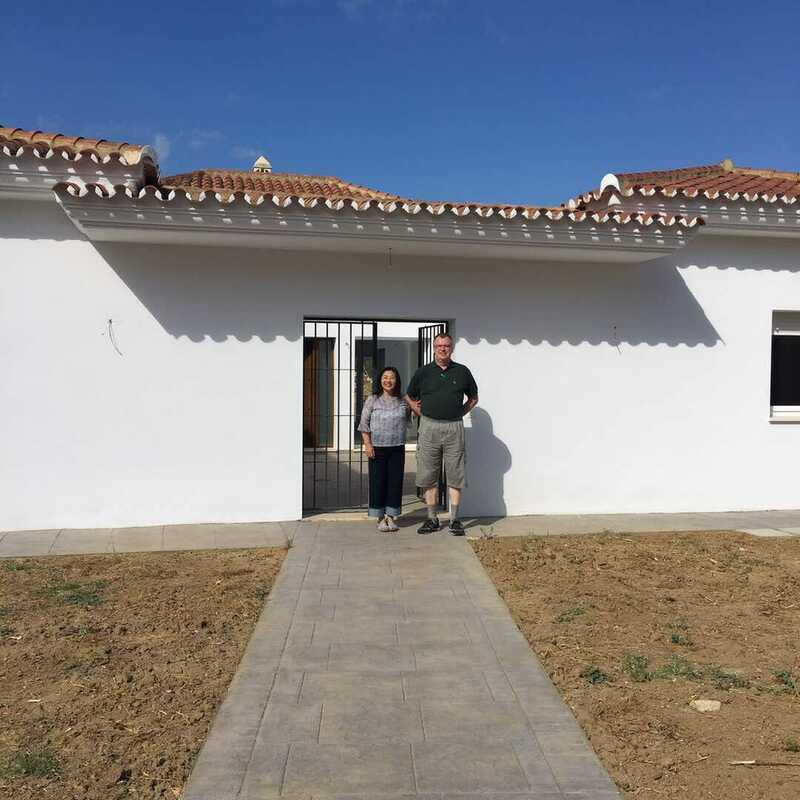 In 2017, Lars and his wife decided to relocate from Shenzhen, China to Andalusia, Spain. Lars’s wife is Hong Kong-born, and he is Danish. They have both lived in Hong Kong and China for the last 31 years. They had visited Andalusia a couple of times to see whether they would like to live in Southern Spain. They found the climate, food, the people, and lifestyle to their liking. Having made the decision to move to Andalusia, they searched the internet for companies which could assist us with the process of relocation. This is how they came across our Spain Property Finder Service. Discover the steps we took to secure our dream home in Spain sooner than expected, obtained residency and by spending less money! I had originally planned to spend a larger amount of money in order to qualify for the Golden Visa residency route, however thanks to Lisa’s advice and knowledge I opted for the Residency In Spain as non-EU Spouse of an EU Resident route. Lisa and Louise helped negotiate a price that we were happy with and then it was over to their recommended lawyers to get the paperwork started to complete the purchase of the property. This process proceeded effortlessly. Their network of contracts is second to none, we cannot stress enough, the importance of being able to tap into this network of contacts to facility smooth execution of any relocation to Southern Spain. As Lars and his wife were relocating from Asia to Spain, thorough research, detailed preparation and efficient use of time were of the essence. Lars was considering the Golden Visa residency application route as he thought that was the easiest way for his wife to obtain residency in Spain. This involved spending a minimum of €500.000 on a property. However, the property they fell in love was cost less than this amount. Buyer’s Agent Spain’s Solutions: 7 Simple Steps! After some correspondence back and forth where our requirements were narrowing and focusing on what we were looking for. Lisa then started to send various suggestions of properties in the Malaga area. We also looked at various property sites, to see what was available. Having narrowed the search down to a couple of locations, my wife and I booked our “exploration” flight from Asia to Andalusia. The day after we arrived Lisa and Louise came to our hotel for a quick chat before we started to look at properties. And off we went! Lisa and Louise had arranged local property agents to show a number of available properties. The first day we saw about 6 or 7 different properties in the Alhaurin el Grande/Coin area, one of which immediately caught our attention. The second day we saw another couple of properties, with a different property agent, one of these properties was outstanding, but a bit remote. Having seen about 10 different properties in different locations we decided to select one of the properties we had seen on the first day. Having settled on this particular property, Lisa and Louise helped negotiate a price that we were happy with. Then it was over to their recommended lawyers to get the paperwork started to complete the purchase of the property. This process proceeded effortlessly. Since I am an EU citizen, but my wife is not, the lawyers will also handle our residency registration. Again this is proceeding smoothly. I had originally planned to spend a larger amount of money in order to qualify for the Golden Visa residency route, however thanks to Lisa’s advice and knowledge I opted for the Residency In Spain as non-EU Spouse of an EU Resident route. Everything went smoothly and we received the keys to our dream home in Spain a mere TWO months from the day of our first visit! As new citizens to Spain we also needed to arrange medical insurance coverage, Lisa and Louise handed us over to an excellent insurance broker, who can handle all types of insurance, i.e. medical, house, car, and other insurances which might be required. We asked Lisa and Louise whether they could recommend any person or company who could handle this for us. Since the floor in the house was already laid, this would be a major renovation project, as the existing floor would have to be removed, under floor heating/cooling to be installed, and a new floor installed. The renovations of the house are now nearing completion, and everything is looking very good. And we will be very nice and warm during the coming winter months. Due to all the renovations, garden design, alarm installation etc. we will only move into our property by the end of June. Consequently, we needed a place to call “home” for about 6 weeks, Lisa and Louise came through big time on this as well. Recommending a holiday home company in Alhaurin el Grande! Here we found a wonderful small Finca just outside town, which we can highly recommend to others whom might be staying short term in Alhaurin el Grande. When you purchase a property in Spain you also need to register with the local town hall, in our case Alhaurin el Grande, Louise arranged this and went with us to the town hall to assist with the necessary paperwork and Spanish if required. This registration is called Alta de Padron, and you need this certificate for residency registration if you purchase a car, and possibly other matters as well. Louise assisted us in arranging Internet/TV/and Phone connections, purchase a car, and other practical matters. Save time and money by reserving your bespoke property finder service. Limited availability … Get your free initial consultation now!